If this carved butterfly wall hanging looks familiar, it’s because I explained how to make one single butterfly in a post back in September here. I love that butterfly and have had it brightening up an empty corner of my bathroom. And what’s better than one butterfly? A whole group of them! By changing up the colors and varying the text on each one, I now have a fun butterfly wall that will bring the springtime indoors. Learn how to make these DIY butterfly decorations below. 1. You can find complete directions and a link to download* my carved butterfly wall hanging design to make the first butterfly here. 2. Cut out two additional butterflies using the same directions as for the first butterfly. Remove the Sulky transfer sheets from each one. 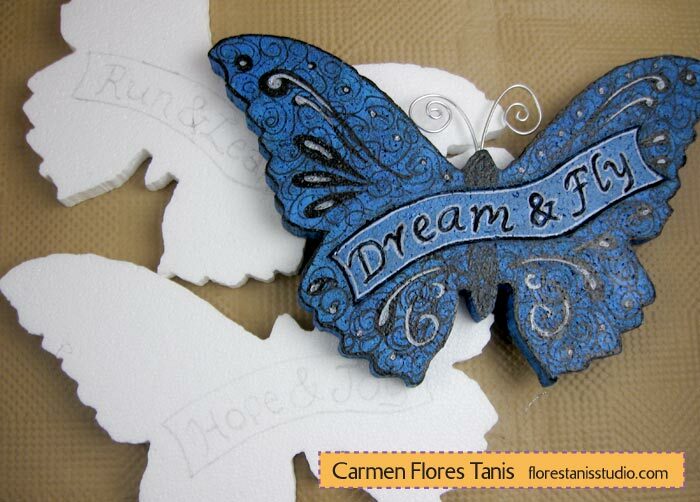 With a pencil, lightly draw a banner and the words of your choice on the two butterflies. 3. 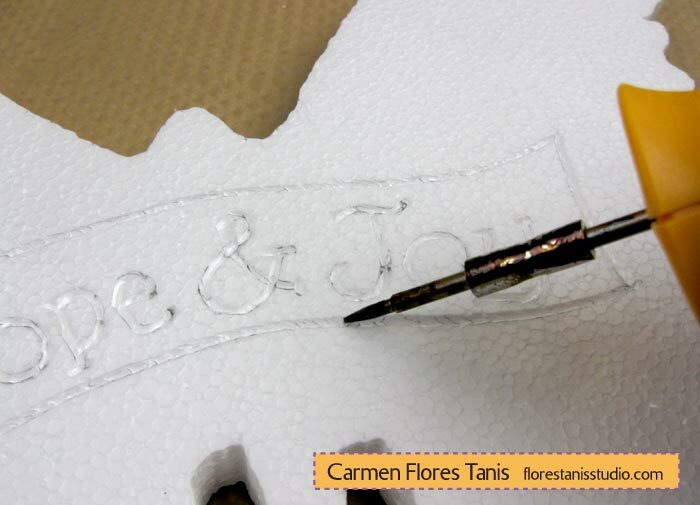 Use the engraving tool to carve the wording into the foam. 4. Paint the butterflies black. Let dry. 5. Dip the paintbrush into the medium blue, then wipe most of the paint off onto a paper towel and “dry brush” the blue on top of the black. Set aside to dry. 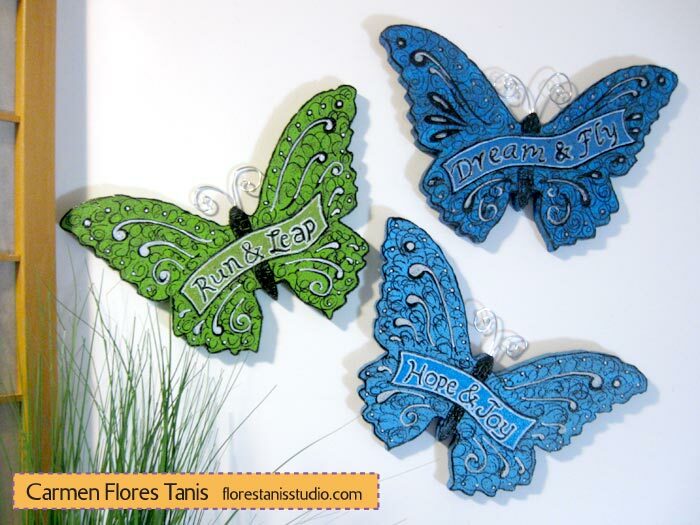 Repeat for the second butterfly using lime green paint. Let dry. 6. Paint the banner area on the blue butterfly with a few coats of blue metallic paint. 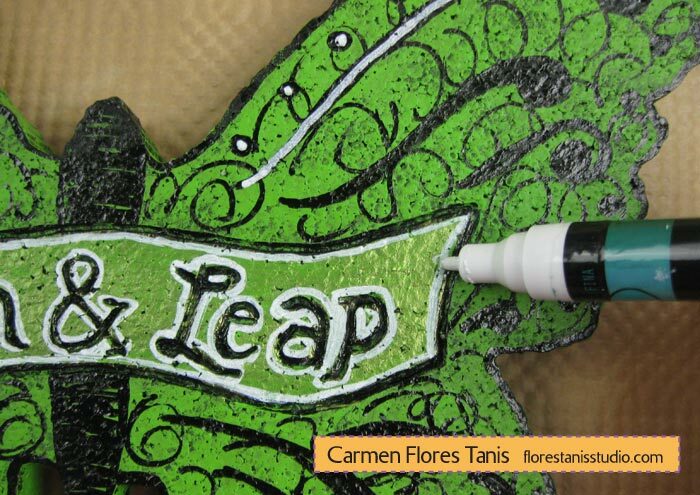 Do the same on the green butterfly using the metallic green paint. 6. Add details with the paint pens as shown. 7. To form the antennae on each butterfly, cut two pieces of wire to 5″ long. Twist one wire into a loose spiral and insert it into the top of the butterfly. Secure with a drop of white glue. Repeat for the second wire. 8. Glue a picture hanging hook to the back of each butterfly. Now your DIY butterfly decorations are ready to hang! This entry was posted in General Crafts, Home Décor Crafts, Special Techniques and tagged Animals, Blue, Sheet, Sign, Wallhanging by Carmen Flores Tanis. Bookmark the permalink.